by Rob - June 19th, 2013. Finalists: Anderson & Savile, Benford & Niven, Bishop, Bova, McDevitt, Reynolds, and Santos. 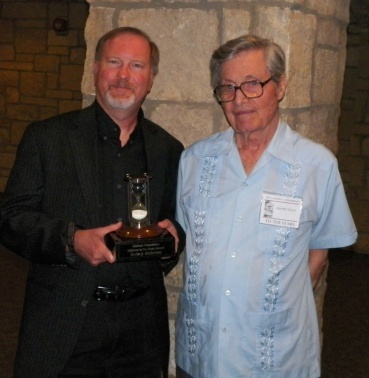 On Friday, June 14, 2013, the Lifeboat Foundation presented the “Lifeboat to the Stars” award to Kevin J. Anderson and Steven Savile for their collaborative book Tau Ceti. The authors split the $1,000 prize, and each received a handsome trophy in an hourglass design. Anderson was in attendance at the ceremony, and received the award from SFWA Grand Master James Gunn; Savile, who lives in Sweden was not able to join us at the event. Anderson, Kevin J. and Steve Savile. Tau Ceti. Arc Manor, 2011. Benford, Gregory and Larry Niven. Bowl of Heaven. Tor, 2012. Bishop, Michael. “Twenty Lights to `The Land of Snow'” from the anthology Going Interstellar, Baen, 2012. Bova, Ben. “A Country for Old Men” from the anthology Going Interstellar, Baen, 2012. McDevitt, Jack. “Lucy” from the anthology Going Interstellar, Baen, 2012. Reynolds, Alastair. Blue Remembered Earth. Ace, 2012. Santos, Domingo (translated by Stanley Schmidt). “The First Day of Eternity.” Analog, January-February 2011. Coordinating judge was Hugo, Nebula, and Campbell Award-winning science-fiction writer Robert J. Sawyer, and the other judges were Catherine Asaro; Jason Batt; Kevin Berry; James Blodgett; Brenda Cooper; Niklas Jarvstrat; Jim Karkanias; Rouslan Krechetnikov; Eva-Jane Lark; Mike McCulloch; George Perry; John Strickland, Jr.; and Allen Taylor. The award was suggested by Frederik Pohl and James Gunn, and named by Gunn. Tau Ceti was the first volume in Phoenix Pick’s “Stellar Guild” series, which pairs an established writers — in this case, New York Times bestseller Anderson — with his or her handpicked protege to write a pair of connected works. Mike Resnick is the series editor. Phoenix Pick is the science-fiction imprint of Arc Manor Publishers, Rockville, Maryland. Says coordinating judge Sawyer: “Tau Ceti tells of a generation ship approaching that nearby sun-like star of the title, and it does so in an unusual manner, combing a novella by Kevin J. Anderson and a sequel novelette by Steven Savile into one fast-paced, character-rich, technologically accurate adventure story. “In the capable hands of both authors, interstellar travel doesn’t just seem possible but inevitable, and they bring real depth to the issues of generation ships, the politics surrounding such voyages, and the danger A.E. van Vogt first alerted us to in the classic ‘Far Centaurus,’ namely that just because you head out first doesn’t mean you’ll arrive first.